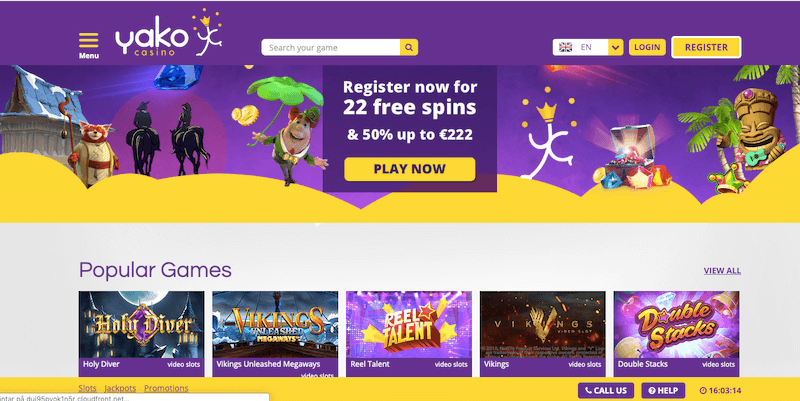 Yako CASINO Review 2019 - Get your BONUS here! Looking for your next favorite online casino? Yako Casino is a massive online European casino offering unbeatable selection in nearly every type of online gambling imaginable. Many games have diverse themes, and all are playable from a mobile device’s web browser. Best of all, this casino combines quantity and quality, with a vast range of different game types, themes, and styles that all offer top-level sound and visual effects. Yako Casino is a multinational company founded by a group of passionate gambling enthusiasts. These founders are on a constant mission to create the most personalized and glamorous online casino experience in the world. In Swahili, “Yako” means “Your,” so the company names itself as “Your Casino.” Considering their collection of awesome online games from top game providers, with something for everyone, Yako Casino has certainly earned its name. Among the astounding selection in Yako Casino’s portfolio, players will find plenty of games, slot machine or otherwise, to fit their style. See our Yako Casino slot machine, blackjack, and roulette review below. Along with traditional slot machine games of all varieties, Yako Casino also offers far more tournament slot games than you might expect. Tournament slots involve winning points rather than money, and cash prizes are given to the players who win the top spots at the end of the tournament. Video slots, a growing trend around the world, are also available, with games like 300 Shields, Terminator 2, and Showgirls. Yako Casino has many roulette games for players to try, of both low and high-stakes wagering. Enjoy French, European, and American Roulette, both standard and live with a real dealer and players. As noted, Yako Casino offers plenty of high and low card table games. This includes all forms of blackjack, including the elusive single-deck version. Many versions of baccarat, poker, Caribbean stud, and more await you. You’ll also find a huge selection of live blackjack games and other live card table games. Who Wants To Be A Millionaire: This slot machine, based on the famous game show, features 5,670 Megaways to win and a host of exciting bonuses. Each spin plays a thrilling musical ditty reminiscent of the show and has self-destructing tiles that disappear when matching, moving out of the way to earn the player more potential winnings. Reel Talent: This talent competition and reality show-themed slot game feature detailed and charming animal characters like a rabbit magician, lion singer, and wolf guitarist. Reel Talent uses two cool features: Symbol Storage and Superspin, which offers three different types to increase variety and the player’s chance of winning a huge jackpot. Vikings: This game is an excellent way to test your luck on slots while enjoying a more intense and dark appeal. It features a stunning presentation with narration, movie theatre-quality sound effects, and grimy character portraits that all speak to the primal excitement of the movie Braveheart. Players will match symbols with both character faces and shields of varying types, with special bonus modes including Shield Wall and Raid Spin.